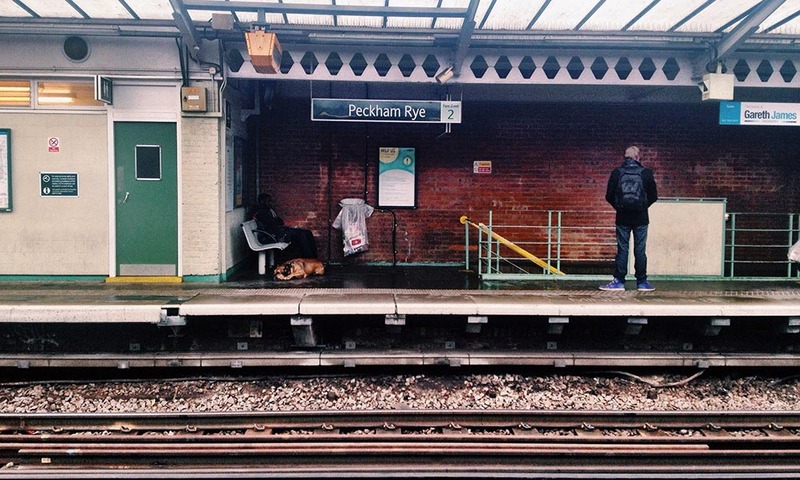 Peckham has long been touted as “the new Shoreditch”. The local art college has provided a steady stream of artists to the area who, enticed by the cheap rents, stuck around post-college and made it their home. Those days of cheap rents are ending but Peckham has by no means hit the commercialism of Shoreditch. I’ve lived in the area for more than ten years. I saw the changes as small pockets became gentrified and more and more cafes, delis and art studios popped up. Although over-gentrification is always a concern, for now I think the mix works well. Hipster cafes sit side by side with Afro-Carribean hair salons, and while you’ll find artisanal grocers selling pricey produce, you can also head to the market and pick up £1 bargain bowls. It’s my favourite place in London, and if you fancy something off the beaten track next time you’re in town, I really suggest you visit. Here’s a little guide to Peckham to get you started in the area. Rye Lane is Peckham’s high street lined with butchers, grocers, high street chains, and Afro-Carribean hairdressers. Parallel to Rye Lane, you’ll find Bellenden Road, also sometimes referred to as Bellenden Village (although that makes you sound like a snob). Bellenden Road is the antithesis of Rye Lane and is the heart of the area’s gentrification. Peckham Rye station is on Rye Lane and is a good starting point for exploring the area. The station takes its name from the 114-acre Peckham Rye Park and Common, which is at the south end of Rye Lane, about a 5-minute walk from the station. Surrounding Peckham Rye are Queens Road Peckham, Nunhead, Camberwell and Dulwich. Camberwell is another artsy area popular with students, Nunhead and Queens Road are less developed and still with cheap rents, and Dulwich is what you’d call posh, especially Dulwich Village. South London Gallery is a top quality contemporary art gallery well known for its exhibitions and live art events. It’s also home to the No.67 café and an excellent art bookshop. This useful guide to galleries in the area also runs tours and hosts a late night opening of galleries on the last Friday of every month. Perhaps the cheapest cinema in London, you can get tickets at Peckham Plex for as little as £3. Peckham Rye is a great spot for sunny days. It’s a massive area and includes a few formal gardens as well as an arboretum, a picnic area and a cafe. This opened the week we moved back to Peckham and was serendipity itself. 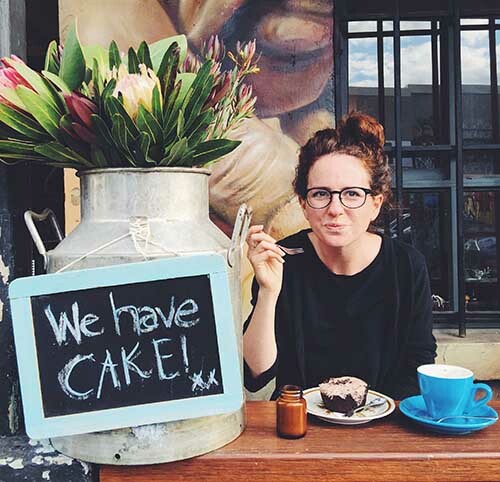 As you know, we’re huge fans of food markets and now we have one on our doorstep. Selling everything from cheese to flowers to hot cooked street food, Peckham Market is a perfect way to start a Saturday. Yogarise is a lovely modern studio in the Bussey Building with a busy timetable of classes to suit all levels and tastes. I particularly like the Mindful flow classes by Beth. A wonderful independent bookstore, expertly curated by the owner, and with a fine selection of magazines. Just being in Review makes me happy. Threads is a quality vintage shop with lots of excellent finds on the lovely Bellenden Road. I’ve always referred to this as the shop that has everything. One day Steve and I were shopping for Christmas tree decorations. He said he wanted to put a lizard on top of the tree. We stepped inside and lo and behold there was a decorative lizard on sale. I think the shop may be magic. A popular Persian deli, Persepolis has great humous and other mezze delights. I love Peckham cafes so much that I decided to dedicate a whole post to them. 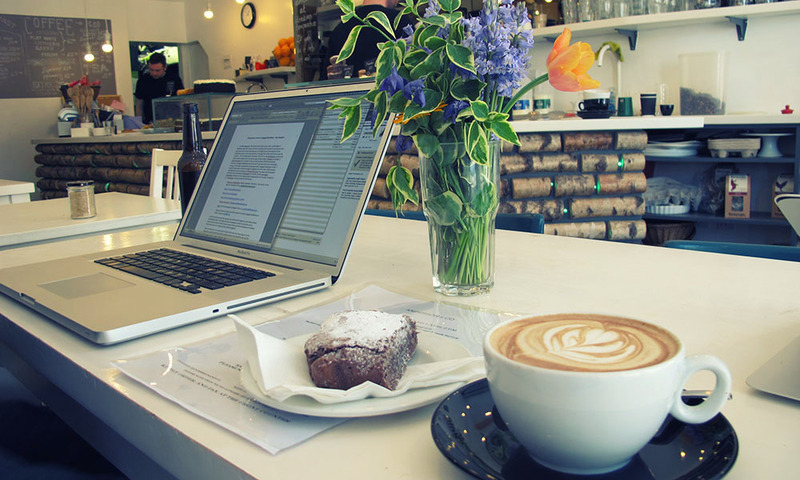 Read my round-up of the best cafes in Peckham. Same goes for restaurants as for cafes – they deserve their own page. 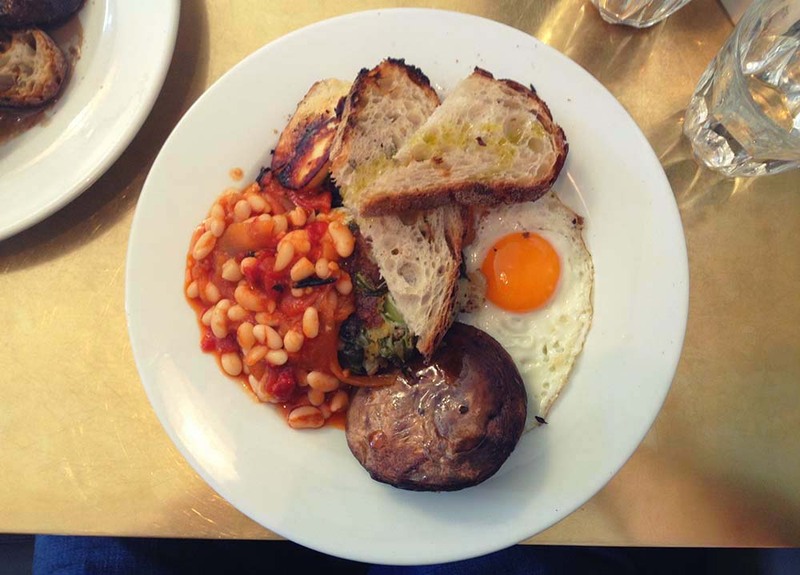 Read my round-up of the best restaurants in Peckham. If you’re lucky enough to be in Peckham during the summer, don’t miss Franks, the roof-top bar on top of a multi-storey car park just off Peckham High Street. The views are awesome and it also hosts a yearly sculpture park. Favoured by the Peckham art crowd, The Montpelier or “Monty” is one of my favourite local pubs. The hearty pub food is delicious, and there’s a cinema in the back room that offers a well-curated selection of films. The Victoria is a classic London gastro pub with a good menu, a selection of games and a clientele that’s erring towards the more East Dulwich side of Peckham. It’s popular with young families for Sunday roasts and has a kid’s playroom at the back. Bar Story is a low-key bar beneath the railway arches and is somewhat of a peckham institution. Mostly popular with students who can be found drinking happy hour cocktails huddled around the bonfires in the bar’s garden. Just across the road from the art college, The Peckham Pelican café / bar is popular with students especially during happy hour. CLF Art Café (AKA The Bussey Building) is a multi-level warehouse space that hosts music, art, theatre, film, and almost any sort of art event. The club nights there were some of the first to mark Peckham as a serious nightlife spot. People rave about the nights at retro Canavans Pool Club, most famous for its experimental techno.I admit we haven’t been yet. Rye Wax is a basement cafe/club which also doubles as a vinyl shop. We’ve only been during the daytime when it was quiet in terms of the amount of people but really loud in terms of music. If you’ve ever been to a club or bar when its empty during the daytime, it felt just like that. I imagine it’d be a lot better at night. Peckham Springs. We haven’t tried this Summer pop-up yet but we’ve heard good things and it’s in the popular Sassoon Gallery under the Peckham Railway arches. The Victoria pub on Bellenden Road has dorms and budget hotel rooms perfectly situated on Bellenden Road. For something a little more boutique, go to The Church Street Hotel on Camberwell Church Street. The stylish Mexican-themed hotel is also home to the wonderful Angels and Gypsies tapas bar. There are also a lot of great Air BnBs in the area including our house! You’re in London so expect to find wi-fi in most cafes (but not in Petitou). There’s also a co-working space called The Office Club. There are two train stations in Peckham – Peckham Rye and Queens Road Peckham. Both are on the London Overground line as well as having National Rail trains to London Bridge, Victoria and St.Pancreas. Peckham is also well served by buses from all over London. Use TfL Journey Planner to map your route. My daughter is considering the new Mountview college campus for entry in 2018. Think it’s being built on land in Peckham Hill Street. Is this a great place for a student to set up and ‘do life’ in? Is it pretty easy finding student digs in this location? Yes definitely. I lived in Peckham when i was a student. And the nearby Camberwell Art College means it’s always full of students. Nowadays accommodation is more expensive, but it’s still affordable around Queens RoD Peckham and Nunhead. I think Peckham is the ideal place to be a student. Your daughter will love it. ?